Blurb Description: Hope dreams of working backstage in a theatre, and she’s determined to make it without the help of her famous costume designer mum. So when she lands an internship on a major production, she tells no one. But with a stroppy Hollywood star and his hot young understudy upstaging Hope’s focus, she’s soon struggling to keep her cool… and her secret. 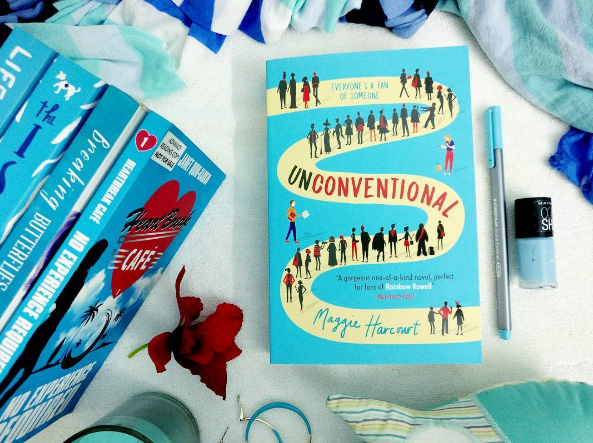 If you don’t already know, Maggie Harcourt’s second novel, Unconventional was one of my ABSOLUTE FAVOURITE reads of 2017. It was adorkable, awkward, filled with RIDICULOUSLY cute moments, authors and being locked in convention centres! Absolutely stunning, and a MUST read. As soon as I was done, I stalked Maggie Harcourt’s Goodreads profile, only to find her next book, Theatrical listed RIGHT THERE. Needless to say, it made my 2018 ‘HAVE TO READ’ list. 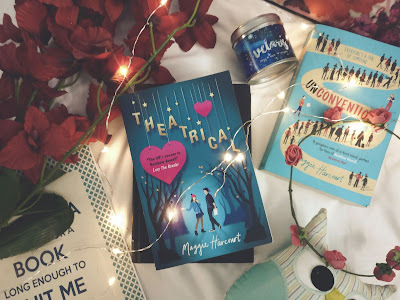 IN A NUTSHELL: Theatrical had all the elements I LOVED about Unconventional – family, finding yourself, romance, awkwardness, girls with Purpose and it was SUCH a glorious read. In fact, it was THE highlight of an otherwise very crappy week. At the same time, while it was a GOOD, even GREAT book, it lacked that final element that made Unconventional PERFECT, and I can’t even explain what it is. 1. ALL THE THEATRE: I adored looking at the theatre through Hope’s eyes. I’m not an ardent fan like she is, but I’ve always admired the shows and the cast and I loved the love letter to theatre that was Maggie Harcourt’s Theatrical. 3. TOMMY KNIGHT: He wasn’t a character I thought I’d like within the first few chapters of the book, but this movie star grew on me, especially as he covered for Hope and Luke, and actually grew into a real person, with real hopes and fears. 4. THE SMALL SURPRISE APPEARANCE IN THE FINALE: THERE WAS A SMALL CROSSOVER BETWEEN MY FAVOURITE BOOK OF 2017, Unconventional, and this one at the VERY END AND I LOVED IT SO MUCH. I was pretty much flailing and AAAAH. 5. ALL THE AWKWARDNESS: Really, this is a legitimate thing. 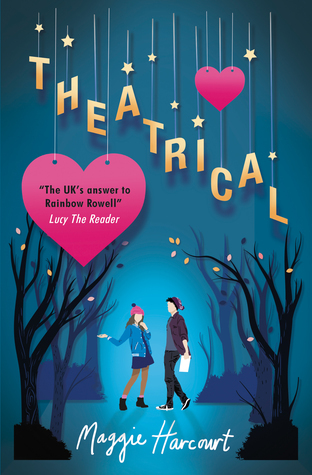 I loved that all teenagers, but especially Luke and Hope in this book were so awkward and perfect, and it was really quite funny to read. WOULD I RECOMMEND THIS BOOK? Definitely, ALONG WITH UNCONVENTIONAL, which is just the most perfect thing ever. A hilarious, ultra-adorable love letter to theatre filled with the cutest romance that is just a perfect feel good read. Maggie Harcourt was born and raised in Wales, where she grew up dreaming of summer road trips and telling stories for a living. As well as studying Medieval Literature at UCL, Maggie has variously worked as a PA, a hotel chambermaid and for a French chef before realising her dreams and beginning to write full time. She now lives just outside Bath, UK, where she can usually be found in a bookshop or somewhere near the river. She guards the secret of her favourite coffee shop jealously, because she has the perfect spot picked out there for people-watching. Have you read any of Maggie Harcourt's books? DID YOU FALL IN LOVE WITH THEM? What's one of the best books you've read this year?